The Operate Member Portal allows users to add two types of payment methods when using RentShare: Bank Account and Credit/Debit Card. See here more information about setting up and configuring RentShare in Operate, and here for more detail about how clients can make payments using RentShare. A payment method may be added when making a first payment on the portal but also without making a payment. To add a payment method, without making a payment, start by hovering over your username in the main menu bar, then selecting Payment Settings. Set a payment method, under With. View the fee applicable to your payments. 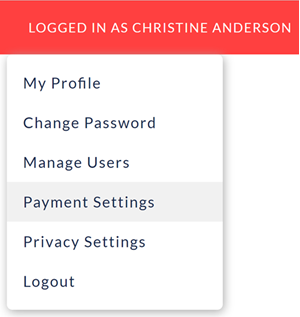 Turn Autopay on or off using the toggle - this allows you to enable or disable recurring payments on the portal - e.g. for your monthly rent invoices. If there is an existing payment method, you will see it listed under "with". Click the dropdown and select Add a New Payment Method. You will have the possibility to either add a Bank Account or a Credit/Debit Card. There is no fee for bank account payments. For Credit Card payments, RentShare charges a 2.89% transaction fee; while Debit Card payments are charged with 0.99%/payment. Your Account Number - enter then confirm it. The Routing Number - Also called an RTN. If you do not have it, please contact your bank to obtain it. The Security Code on your Card. The Name on your Card. Your Address - Please enter your address exactly as shown in the example in the field; otherwise it will not be validated.